The fishing industry’s critical role in North Korea’s economy, particularly its foreign currency earning operations, led to a series of international sanctions on North Korean seafood. Concurrently, significant modernization and expansion has been underway since 2015 at the KPA's Fishery Station No. 15 on the east coast. Observed activity over the past three years indicates this project is one component of a far-reaching strategic effort to develop the country's fishing industry. North Korean fishing industry’s critical role in the nation’s economy, particularly its foreign currency earning operations, led to a series of recent international sanctions starting with an August 2017 UN Security Council prohibition of North Korean seafood imports. 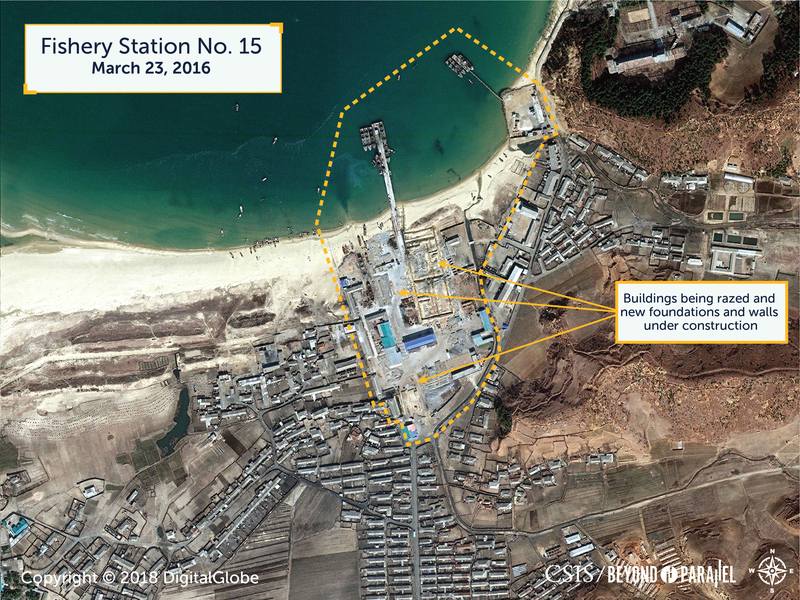 Concurrently, since 2015, a significant modernization and expansion project has been underway at the Korean People’s Army (KPA) Fishery Station No. 15 on North Korea’s east coast. 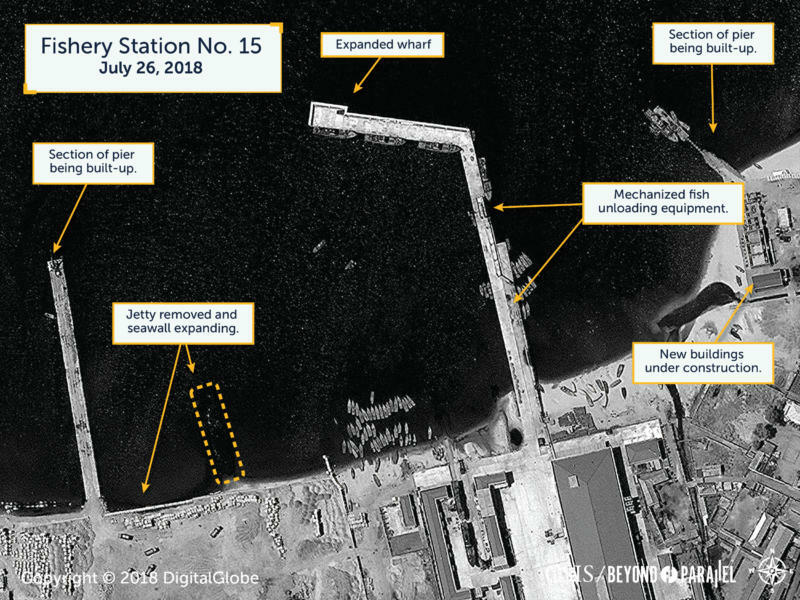 Satellite imagery clearly indicates the development of Fishery Station No. 15, a multi-year modernization and expansion project, is scheduled to continue for the remainder of 2018 and potentially into 2019. The activity observed at Fishery Station No. 15 over the past three years probably indicates this project is more than a basic modernization and expansion of a single fishery station. Rather it may be a component of a far-reaching strategic effort to develop North Korea’s fishing industry, an effort recently reinforced by declarations from the summer 2017 Cabinet Plenum. 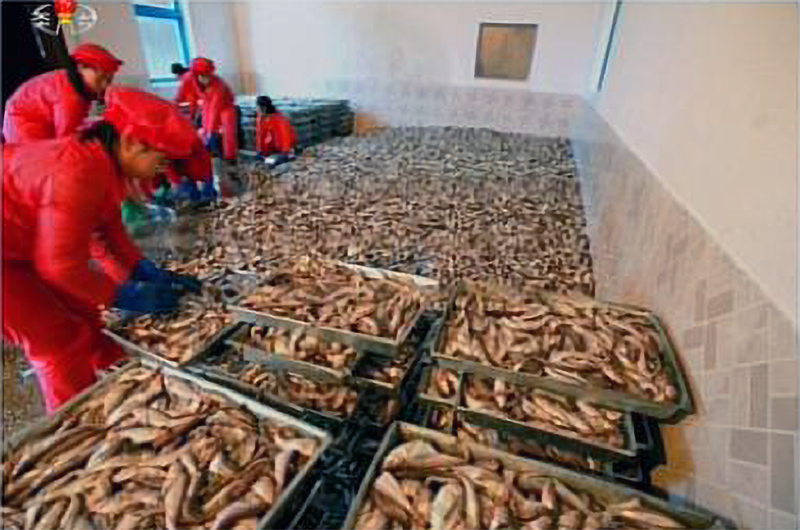 Enforcement of international sanctions on North Korean seafood should be expected, therefore, to have an impact on both North Korea’s baseline fisheries earnings and the expected future return on the regime’s investment of resources and strategic effort in this modernization project. North Korea's fishing industry occupies a critical role in the nations economy and social fabric. Its role in the nations economy, particularly its foreign currency earning operations, led to the international prohibition of seafood imports (including fish, crustaceans, mollusks, and other aquatic invertebrates in all forms) from North Korea in UN Security Council Resolution 2371 in August 2017. Socially, while fish represent a primary staple in the diet of both North and South Koreans, for the North it occupies a more critical position having facilitated the populations survival through the tumultuous economic collapse and famines of the 1990s and more recently through wide swings in agricultural production. Since the August 2017 UN sanctions, the U.S. added unilateral sanctions of the North Korean fishing industry on September 21, 2017 through 13810 Executive Order. On December 22, 2017, the UN Security Council passed resolution 2397, further clarifying the sanctions also prohibit North Korea from selling or transferring, directly or indirectly, fishing rights. The U.S. then added its own unilateral actions prohibiting the purchase of fishing rights from North Korea on January 3, 2017 with the Countering America's Adversaries Through Sanctions Act (CAATSA), PL 115-44. 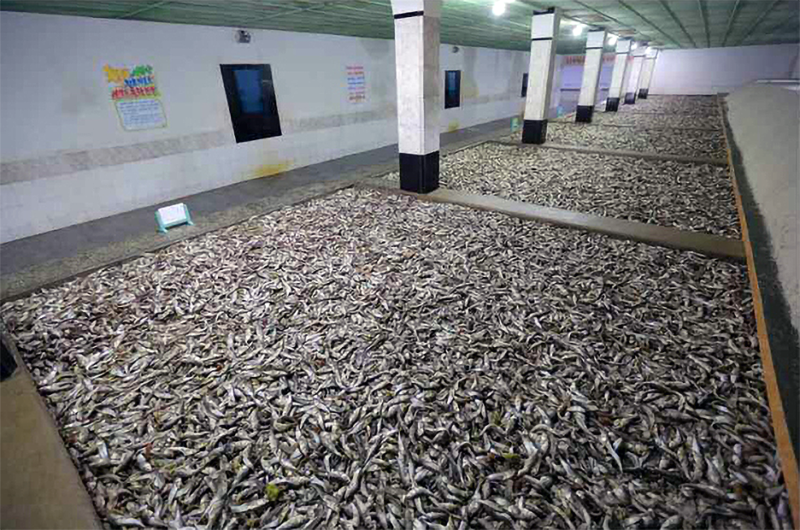 Enforcement of these international sanctions on North Korean seafood should be expected, therefore, to have an impact on both North Korea's baseline fisheries earnings and the expected future return on the regime's investment of resources and strategic effort to modernize its fishing industry. May 27 Fishery Station, under KPA No. Unit 534. The KPA has always operated a second economy in parallel with the domestic economy. Reforms that started with events of the 1990s have continued to evolve since Kim Jong-un assumed power and the KPA has devoted a greater effort than it had historically to food production and foreign currency earning. Kim Jong-un also taken a more proactive role in both praising and criticizing economic projects. The level of praise Kim has specifically granted to the KPA's fisheries has been notable and evidenced by the number of visits and on-the-spot guidance trips taken by Kim and other high-level KPA and Worker Party of Korea (WPK) officials reported by state media.7 Annual worker ceremonies also celebrate the achievements of the so-called activists in fisheries under the KPA. These annual events appear to have reached new heights in 2013 and were reported in 2014,8 2015,9 and 201610 to applaud fulfillment of fishery production goals. Since 2015, a new and significant modernization and expansion project has been underway at Fishery Station No. 15 on North Korea's east coast, 8.7 km east of the port city of Wonsan-si, in the village of Namsong-ni, Anbyon-gun, Kangwon-do. The fishery, operated under KPA Unit No. 549, was reportedly inaugurated in 1972. However, a declassified satellite image acquired on December 8, 1974 of Namsong-ni shows elements of a tiny village but no indication of any significant fishing activity. If the 1972 date is correct, then Fishery Station No. 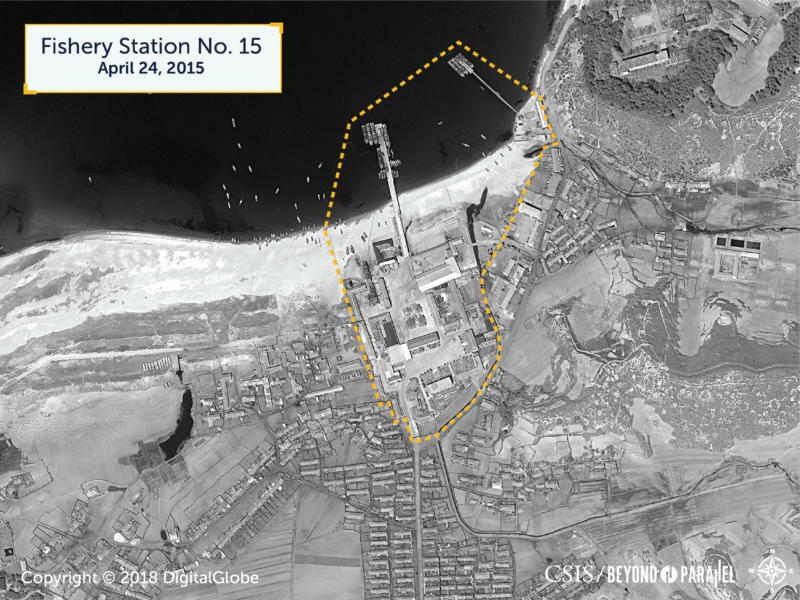 15 may have been located elsewhere potentially in Wonsan at that time. An overview of the Namsong-ni area showing no indications of significant fishing activity. 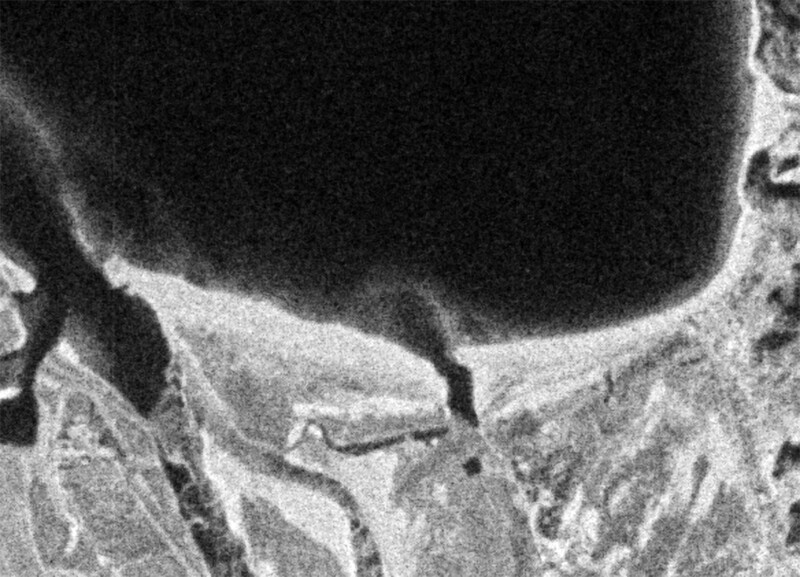 (CIA, Declassified KH-7 image from KH-7 mission 1207, December 8, 1974). Little open source information is readily available concerning the stations development or operations prior to 2015, except that Kim Jong-il had once visited it. Satellite imagery from 2002-2014, however, provides some insight. By 2002, the village of Namsong-ni had grown considerably and Fishery Station No. 15 was well established. 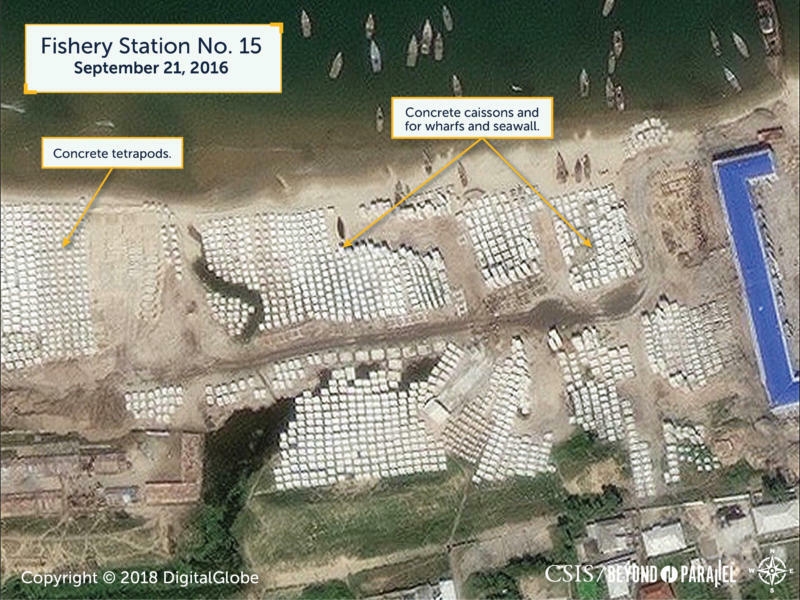 Satellite imagery generally available in Google Earth shows during the next 13 years the station was generally active with fluctuating numbers of fishing vessels present and minor infrastructure changes typical of what would be expected to be seen along the coasts of North Korea. The facility encompassed approximately 10 hectares and consisted of approximately 24-26 buildings (split between a main facility and what appears to be a small support compound 100 meters to the northeast), a 165-meter-long wharf, the partial remains of an old pier to the northeast, and a rudimentary shipyard and single repair way for fishing vessels. A crude 55-meter-long pier, immediately to the west of the facility was present in 2002 but was razed sometime in 2012. In 2014, a minor renovation took place at the station during which a new building was erected, three buildings had new roofs installed, the yards and wharf were resurfaced, and decking was placed on the old pier to the northeast allowing for regular light use. 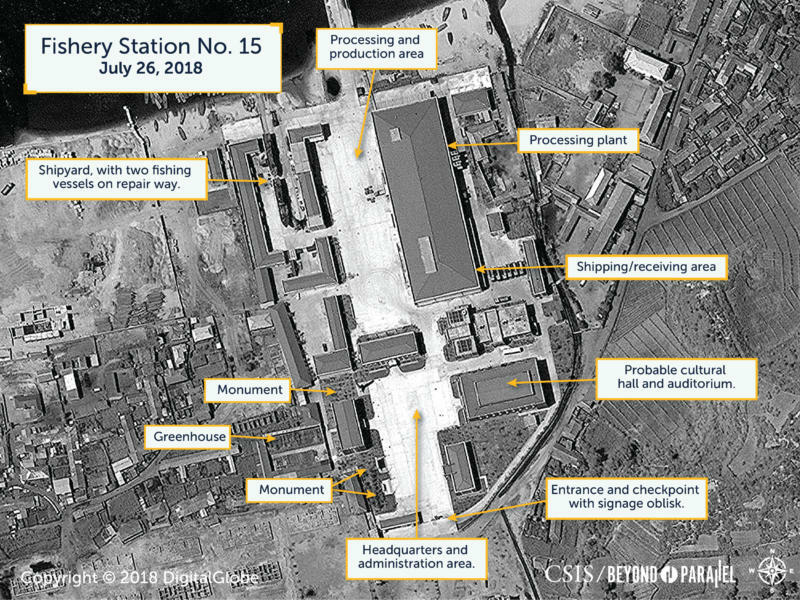 Satellite imagery from April 24, 2015, prior to Kim Jong-uns first visit, shows the facility as it looked before the start of the subsequent multi-year modernization and expansion program. The station encompassed approximately 10 hectares with approximately 32 buildings. 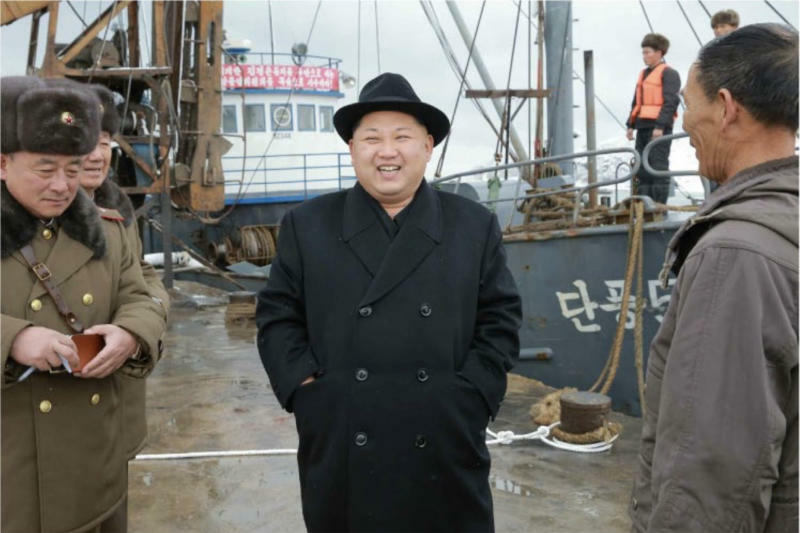 On November 24, 2015, two days after a trip to the August 25 Fishery Station under KPA Unit 313, Kim Jong-un undertook a field guidance trip to Fishery Station No. 15 under KPA Unit 549.14 Here he congratulated the officials and employees of the station for making a big haul to satisfy the Supreme Commanders desire to supply fishes to the service persons every day and supplying fresh fishes to the soldiers in all seasons. Kim's visit to the station was, reportedly, not only to congratulate it on its achievements but also to provide a fresh turning point in the work of the station. 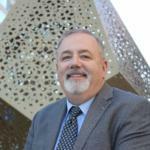 This fresh turning point initiated a sweeping multi-year modernization and expansion program. Among the areas to be addressed under this program were: construction of a new breakwater and wharf; introduction of new fishing and processing technology onshore and on the stations fishing vessels; expansion of the flash-freezing and refrigerating facilities; expansion of mechanization in unloading, sorting, freezing, and storage operations; improved maintenance and repair of fishing vessels; modernization of all production buildings; and improved housing and leisure facilities for members and their families. While outside technical assistance would be forthcoming, much of the physical labor would be undertaken by the officials and employees of the station with assistance from Unit No. 549. The ultimate goals of these projects were to enable it to catch, process, and deliver a greater tonnage of processed fish in fulfillment of newly established goals. 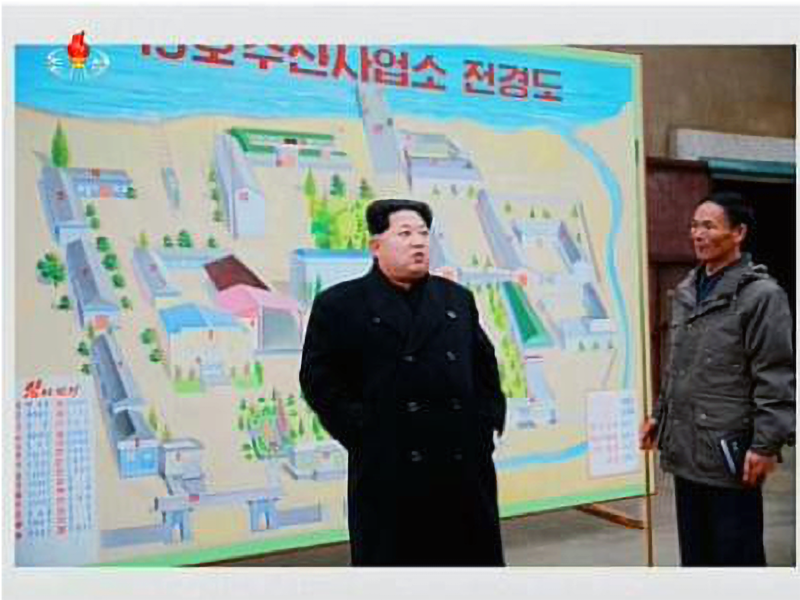 Kim Jong-un standing front of a stylized drawing of Fishery Station No. 15 prior to its modernization. Although this drawing does not show the small compound and old pier to the northeast, satellite imagery clearly shows their use by the fishery station, (Rodong Sinmun, November 25, 2015). 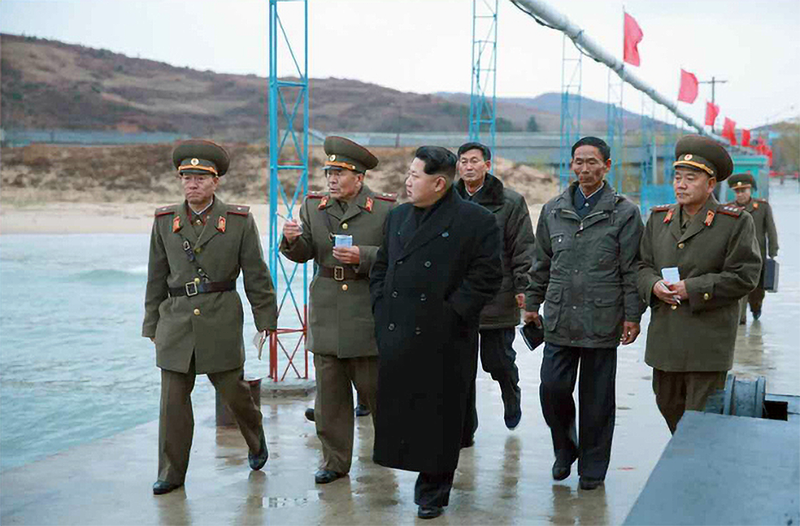 Kim Jong-un walking along the original wharf at Fishery Station No. 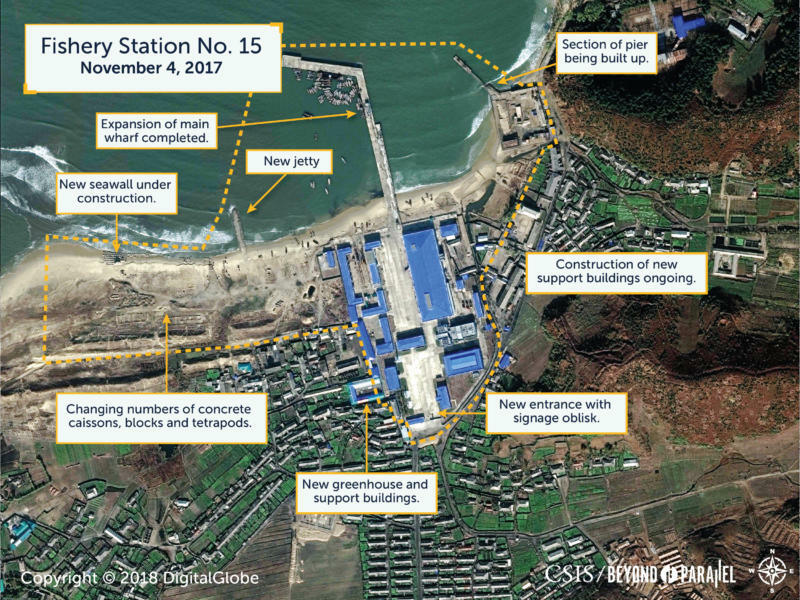 15 prior to its expansion (Rodong Sinmun, November 25, 2015). Satellite imagery from March 28, 2017, shows that steady progress had been made on the main station facilities. There were now approximately 29 buildings, construction of a new greenhouse had begun, the roads and parking areas had been graded and paved, the main wharf had been expanded to 240-meters-long, and nine large fishing vessels were present. By November 4, 2017, the infrastructure of the main facility (including the new greenhouse) was complete, the main wharf had been extended to its final length of 325-meters, a new 60-meter-long jetty had been built to the west of the station, and construction of a long seawall had started. At the northeast pier, an 18-meter-long concrete and earth ramp was built out over the old framework. No large fishing vessels were present. The following year would witness continuing development and expansion of Fishery Station No. 15. 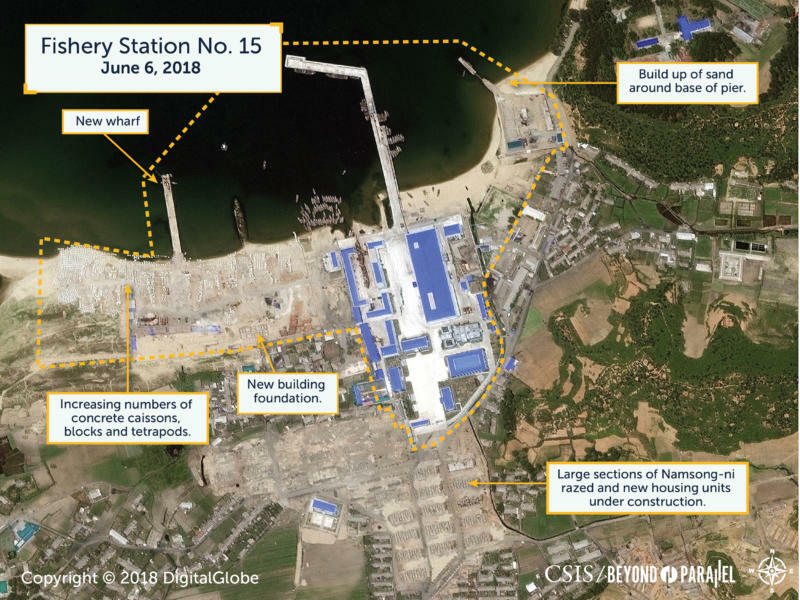 By January 20, 2018, work had progressed to lengthen the jetty to approximately 75-meters-long, seawall construction continued slowly, and the concrete and earth ramp at the northeast pier had been extended to 40-meters-long. Ten large fishing vessels were present. As of July 26, 2018, Fishery Station No. 15 had expanded to encompass approximately 22.5-hectares, construction had continued on both the new wharf, which was now 175-meters-long, and the seawall. The jetty that had been erected during 2017 was removed, the seawall has been widened and extended, and the area immediately behind has continued to be developed. Work continues on the new wharf, which will likely continue to be extended to create a protected boat basin. Six large fishing vessels are present (two of which are on the repair way). Within the village of Namsong-ni, construction on the new housing units slowly continued and most foundations and first-floor walls have been completed. Satellite imagery clearly indicates that the development of Fishery Station No. 15 is scheduled to continue for the remainder of 2018 and potentially into 2019. Pickling tanks at Fishery Station No. 15 with salt pile on right (Rodong Sinmun, November 25, 2015). 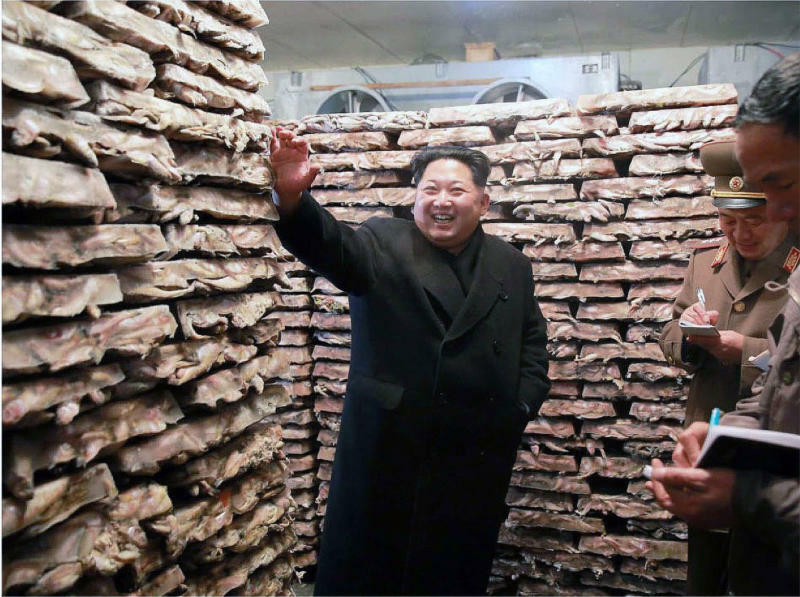 Kim Jong-un in a freezer surrounded by blocks of frozen fish (Rodong Sinmun, November 25, 2015). North Korean fishing industry's critical role in the nations economy, particularly its foreign currency earning operations, led to a series of recent international sanctions starting with an August 2017 UN Security Council prohibition of North Korean seafood imports. 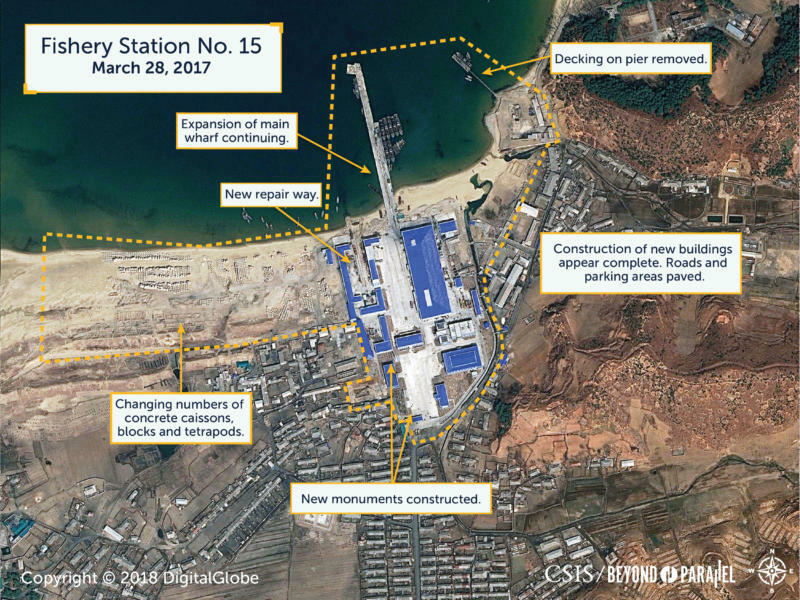 Concurrently, since 2015, a significant modernization and expansion project has been underway at the Korean Peoples Army (KPA) Fishery Station No. 15 on North Korea's east coast. Satellite imagery clearly indicates the development of Fishery Station No. 15, a multi-year modernization and expansion project, which is scheduled to continue for the remainder of 2018 and potentially into 2019. While the data is incomplete, some preliminary insights into its operations may be derived by reviewing the number of large fishing vessels (25-30 meter-long) present in satellite imagery at Fishery Station No. 15. The highest number of large shipping vessels present appears to be at the beginning of a fishing campaign (i.e., season). With the exception of the period when the stations shipyard was being rebuilt, there have been an average of 1.2 larger fishing vessels on the repair ways. This indicates either a proactive program of maintenance and repair, or a low-level of preventive maintenance. The high number (average of 7.2) large fishing vessels present on almost every date observed may suggest a low supply of fuel, a pattern of only sending the fleet out as a group (for security and efficiency), or some other factor. These numbers may be skewed by the possible introduction of additional fishing vessels or the loan of vessels from other fishery stations. The activity observed at Fishery Station No. 15 over the past three years probably indicates this project is more than a basic modernization and expansion of a single fishery station. Rather it may be a component of a far-reaching strategic effort to develop North Korea's fishing industry, an effort recently reinforced by declarations from the summer 2017 Cabinet Plenum. Enforcement of international sanctions on North Korean seafood should be expected, therefore, to have an impact on both North Korea's baseline fisheries earnings and the expected future return on the regime's investment of resources and strategic effort in this modernization project. 1. Ri Chol-su. An Expanded Meeting of the Cabinet Plenum Was Held, Minju Joson, July 21, 2017; and "Kim Jong Un Inspects Completed Koam-Tapchon Railways," KCNA, May 24, 2018. 2. Identified through reviewing North Korean state media (via KCNAWatch) and Wikimapia. 3. The KPA often uses military unit cover designations (MUCDs) when publicly mentioning its military units"Unit No. 549 is such a cover designation. There is some ambiguity in open source information concerning the precise size and designation of KPA Unit 549. Reports dating from as far back as 1998 occasionally describe it as KPA Combined Unit No. 549 suggesting that it may be the corps headquarters responsible for the defense of Kangwon Province on the southeast coast. Other sources identify the corps defending Kangwon Province as the I Corps. For example, Military and Security Developments Involving the Democratic Peoples Republic of Korea (Washington, D.C.: Department of Defense, 2013), 11; Supreme Commander Kim Jong-il Inspects KPA Combined Unit, KCNA, August 4, 1998; and Bermudez Jr., Joseph S. Shield of the Great Leader: The Armed Forces of North Korea (London: I.B. Taurus, 2001), 14-16. 4. Winter Fishing Brisk in DPRK, KCNA, November 14, 2017; 2016 Socialist Emulation in Fishery Reviewed, KCNA, March 7, 2017; 70th Anniversary of Nampho Fishery Station Marked, KCNA, April 19, 2017; Fishery Station Number 15, KCTV, December 31, 2015; Yonchin Fishery Station, KCBS, November 29, 2015; and DPRK Develops, Uses Natural Energy to Resolve Electricity Shortage Problem, Choson Sinbo, November 25, 2015. 5. Sustainable Development of Fishing Industry Encouraged, KCNA, June 21, 2018; and 70th Anniversary of Nampho Fishery Station Marked, KCNA, April 19, 2017. 6. Fishing Boats Built in DPRK, KCNA, October 16, 2017. 7. Winstanley-Chesters, Robert, Politics and Pollack: It Takes a Nation of Fishes, Sino-NK, July 24, 2014, https://sinonk.com/2014/07/24/politics-and-pollack-it-takes-a-nation-of-fishes/. 8. Supreme leader awards decorations to exemplary officials, Pyongyang Times, December 30, 2014, https://kcnawatch.co/newstream/1450714951-990566334/supreme-leader-awards-decorations-to-exemplary-officials/. 9. Participants in 3rd Meeting of Activists in Fisheries under KPA Feted. Rodong Sinmun, December 31, 2015. https://kcnawatch.co/newstream/1451592015-34767500/participants-in-3rd-meeting-of-activists-in-fisheries-under-kpa-feted/. 10. 4th Meeting of Activists in Fisheries under KPA Held. Rodong Sinmun, December 31, 2016. https://kcnawatch.co/newstream/1530452069-867775131/4th-meeting-of-activists-in-fisheries-under-kpa-held/. 11. Ministry of Fishery Interview, KCBS, August 2, 2015. 12. Respected and Beloved Comrade Kim Jong Un Gives On-the-Spot Guidance at Korean Peoples Army Fishery Station No. 15, Rodong Sinmun, December 15, 2016. 13. Winter Fishing Brisk in DPRK, KCNA, November 14, 2017. 14. Kim Jong Un Visits Fishery Station No. 15 of KPA, KCNA, November 24, 2015; and North Korea Newsletter, No.390, Yonhap, November 26, 2015. Concurrent with the modernization and expansion of Fishery Station No. 15, under the orders of Kim Jung-un, a project building a large-scale fishing village zone in the areas of Koam, Tapchon and Chonapho was initiated. This project would witness the displacement of the Tapchon-ni Hovercraft base. "Kim Jong Un Inspects Completed Koam-Tapchon Railways," Rodong Sinmun, May 25, 2018; "Koam-Tapchon Marine Railway Bridge Completed," Rodong Sinmun, June 1, 2018; and Bermudez Jr., Joseph S. and Beyond Parallel. 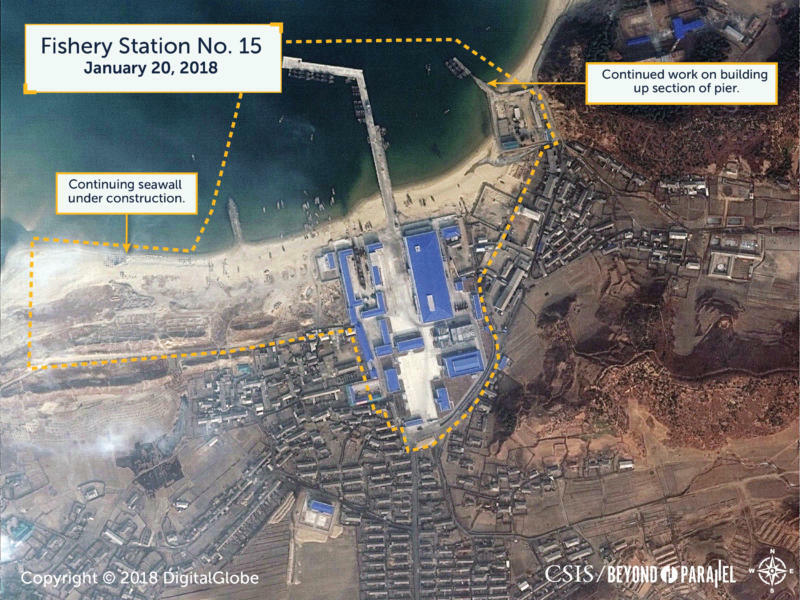 "North Korean Special Operations Forces: Hovercraft Bases (Part III)," Beyond Parallel, February 15, 2018, https://beyondparallel.csis.org/north-korean-special-operations-forces-hovercraft-bases-part-iii/. 15. Fishing nets and fishing-related supplies and equipment are likely received from the Wonsan Fishing Tackle Factory and Songchongang Net Weaving Factory. "Kim Jong Un Provides Field Guidance to Songchongang Net-Weaving Factory and Plastic Tube Shop," kfausa, July 18, 2014, https://www.kfausa.org/kim-jong-un-provides-field-guidance-songchongang-net-weaving-factory-plastic-tube-shop/; In Kim Jong Uns Summer Palace, Fun Meets Guns, Bangkok Post, October 10, 2017; and Wonsan Zone Development Corporation. Project Proposal - New Establishment of Wonsan Fishing Tackle Factory, http://www.naenara.com.kp/en/trade/download.php?wonsan+22. 16. First Fishing Campaign Begins in West Sea of Korea, KCNA, February 25, 2016. 17. Respected and Beloved Comrade Kim Jong Un Gives On-the-Spot Guidance at Korean Peoples Army Fishery Station No. 15, Rodong Sinmun, December 15, 2016. 20. It was reported in 2013 that when Kim Jong-un visited the August 25 Fishery Station under KPA Unit No. 313 he named newly built fishing boats Daanpoong (Autumn foliage) so that they may bring an abundant catch as autumns fertile harvest. Thus, the fishing boats of the August 25 Fishery under the KPA Unit No. 313 were named Daanpoong No. 1, Daanpoong No. 2, and so forth. "Fishing warriors of North Korea Dreaming Fish," NK Today, January 26, 2016, http://nktoday.kr/?p=10927; and "What is the Name of the Fishery Office Named by the First Secretary Kim Jong Un?" Nocut News, May 28, 2013, http://www.nocutnews.co.kr/news/1042015. 21. If the development of Fishery Station No. 15 continues it is likely that the housing area will also expand. 22. See for example, Ministry of Fisheries carries out annual fishing plan, Pyongyang Times, November 27, 2017, http://www.naenara.com.kp/en/order/pytimes/?page=Economy&no=25532 ; North Korean Daily: Kim Jong Un Inspects Fishery Station of Korean Peoples Army, Rodong Sinmun, December 15, 2016.; and Deep-sea Fishing Fleet of DPRK Makes Good Hauls, KCNA, August 20, 2016, http://www.kcna.kp/kcna.user.article.retrieveNewsViewInfoList.kcmsf#this. 23. Information collected from multiple fish databases: fishbase.de, fao.org/fishery, fishsource.org, and seaaroundus.org. See also, North Korea Information Portal . [Fishery industry]. [Ministry of Unification]. http://nkinfo.unikorea.go.kr/nkp/overview/nkOverview.do?sumryMenuId=MENU_68. 24. 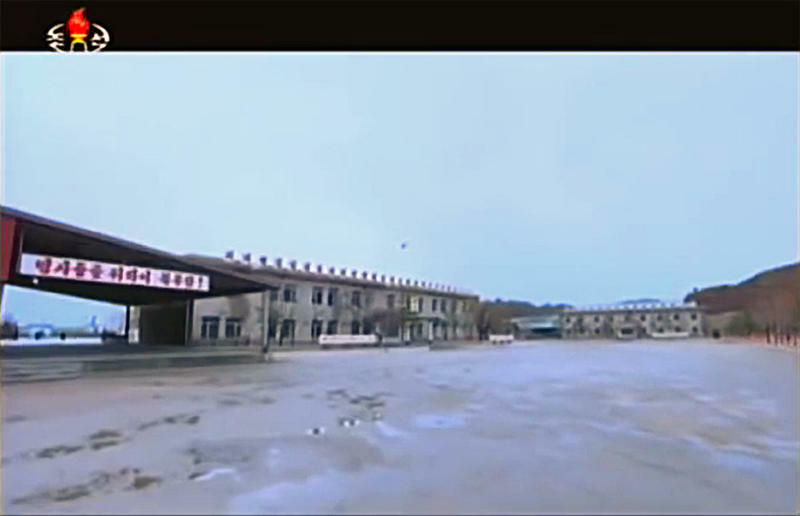 See for example, Kim Jong Un Visits Fishery Station Under KPA Unit 549, Rodong Sinmun, November 25, 2015.; and Kim Jong Un Visits Fishery Station Under KPA Unit 549, KCNA, November 24, 2015, www.kcna.co.jp/item/2015/201511/news25/20151125-01ee.html. 25. Winter Fishing Brisk in DPRK, KCNA, November 14, 2017. 26. Data compiled from a combination of the imagery available in Google Earth and from Digital Globe. 2018 Continued Development Fishery Station No. 15. Station expanded to encompass approximately 22. Station expanded to encompass approximately 22.5-hectares. Construction continued on new wharf, now 175-meters-long, which will likely continue to be extended to create a protected boat basin. Jetty that had been erected during 2017 was removed. Development continued of the large area immediately behind the new wharf and seawall. Six large fishing vessels are present (two of which are on the repair way). Within the village of Namsong-ni new housing unit construction slowly continued with most foundations and first-floor walls completed. Satellite imagery clearly indicates that the development of Fishery Station No. 15 is scheduled to continue for the remainder of 2018 and potentially into 2019. Source(s): Copyright 2018 Digital Globe. New wharf under construction 200 meters west of the station and was now 125-meters-long. Continued work on a seawall that will eventually be at least 300-meters-long. Large area immediately behind the new wharf and seawall cleared and graded. Construction of several new buildings begun. Five large fishing vessels are present. Within the village of Namsong-ni all the dwellings with a large 5.5-hectare area immediately south of the station razed and 29 new housing units (potentially apartment buildings) under construction. Jetty lengthened to approximately 75-meters-long. Concrete and earth ramp at the northeast pier extended to 40-meters-long. Ten large fishing vessels present. Infrastructure of the main facility (including the new greenhouse) completed. Main wharf extended to its final length of 325-meters. New 60-meter-long jetty built to the west of the station. Construction of a long seawall started. At the northeast pier, an 18-meter-long concrete and earth ramp built out over the old framework. Steady progress made on the main station facilities. Now approximately 29 buildings present. Construction of a new greenhouse had begun. Roads and parking areas had been graded and paved. Main wharf expanded to 240-meters-long. Nine large fishing vessels were present. A year after his first visit, Kim Jong-un returned to the Fishery Station No. 15 for a second On-the-Spot-Guidance inspection both to congratulate the unit on fulfilling the annual fishing plan and to assess progress with the modernization program. During his visit, Kim inspected the stations production facilities and fishing vessels, was briefed on the modernization and expansion programs progress, and emphasized the importance of transforming the station by the informatization and the scientization [sic] of production and business activities to bring it into the era of [a] knowledge-based economy. Once again, he set annual fish production goals for the station and stated that his father, Kim Jong-il, would be pleased if the fish caught by the peoples army were sent to the citizens of the capital city. Source(s): Respected and Beloved Comrade Kim Jong Un Gives On-the-Spot Guidance at Korean Peoples Army Fishery Station No. 15, Rodong Sinmun, December 15, 2016., Photo credit: KCTV, December 12, 2015. Several additional buildings externally completed. Work slowly proceeding on main wharf. Station expanded to encompass approximately 14 hectares. Hundreds of concrete caissons, blocks, and tetrapods for expansion and construction of wharfs and a seawall amassed. Approximately 34 buildings were observed that were pre-existing, completed, or still under construction with numerous construction vehicles present throughout the station. The new processing plant, shipyard with repair shops and storerooms, and approximately nine other buildings externally completed. Station’s roads and parking areas yet to be graded and paved. Large fishing vessels were present along the northeast pier, main wharf, and on the repair way. Many of the station’s existing buildings razed. Foundations for new processing plant and other buildings under excavation. Work begun on expanding and modernizing the main wharf. Kim Jong-un undertook a field guidance trip to Fishery Station No. 15 under KPA Unit 549. Here he congratulated the officials and employees of the station for making a big haul to satisfy the Supreme Commanders desire to supply fishes to the service persons every day and supplying fresh fishes to the soldiers in all seasons. Kim's visit to the station was, reportedly, not only to congratulate it on its achievements but also to provide a fresh turning point in the work of the station. This fresh turning point initiated a sweeping multi-year modernization and expansion program. Among the areas to be addressed under this program were: construction of a new breakwater and wharf; introduction of new fishing and processing technology onshore and on the stations fishing vessels; expansion of the flash-freezing and refrigerating facilities; expansion of mechanization in unloading, sorting, freezing, and storage operations; improved maintenance and repair of fishing vessels; modernization of all production buildings; and improved housing and leisure facilities for members and their families. Source(s): Kim Jong Un Visits Fishery Station No. 15 of KPA, KCNA, November 24, 2015; and North Korea Newsletter, No.390, Yonhap, November 26, 2015., Photo credit: KCTV, December 12, 2015. Station encompassed approximately 10 hectares with approximately 32 buildings. 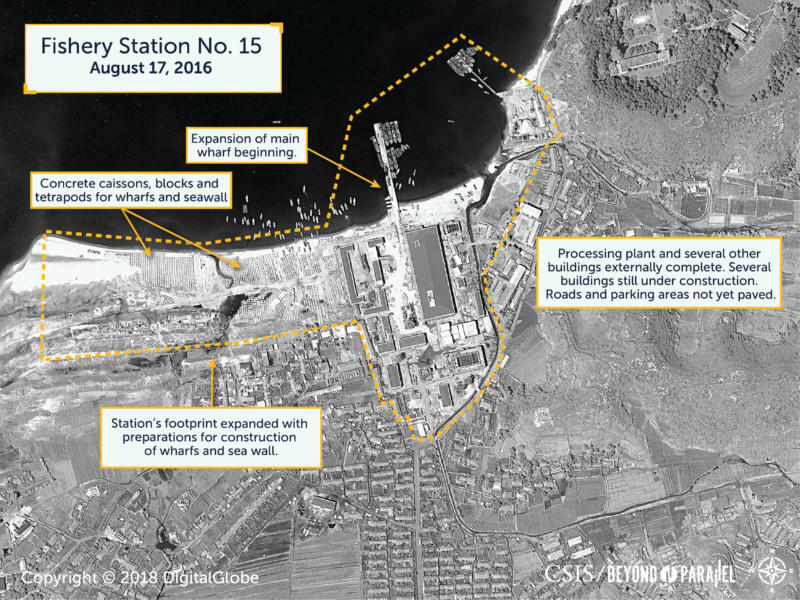 Satellite imagery between September 2016 and July 2018 shows the completion of phase one and significant progress on phase 2 of a multi-year modernization and expansion project at Fishery Station No. 15. The imagery also clearly indicates the development of Fishery Station No. 15 is scheduled to continue for the remainder of 2018 and potentially into 2019. The degree to which international sanctions on North Korean seafood and sale of fishing rights are enforced will largely determine the impact such a regime can be expected to have on North Korea's fishing industry. Should news reports of relaxed sanctions enforcement or of an uptick of fish transfers at sea increase, the North Korean fishing industry, including the KPA's Fishing Station No. 15, will see a reduced impact on their foreign currency earning capabilities. Looking ahead for the status of the ongoing modernization and expansion projects, any one of, or any combination thereof, the following would indicate a strategic decision to further develop the fishery station. This would likely be a continuation, or expansion, of the existing national level fishery expansion plan that was instituted several years ago by Kim Jong-un. Completion of the sea wall and construction of additional piers or wharfs. Expansion of the open area behind the sea wall and the construction of new processing facilities here. Construction of additional housing units in the village of Naming-ni. Presence of additional large fishing vessels or the construction of such vessels at the No. 15 Fishery Station. Moderization and construction at other fishing sites.